Welcome to the first MOTM blog, a regular feature we will be publishing in conjunction with the Monuments for the Future project. Each month we’ll take a look at a type of Scheduled Monument that we have in the Park: we’ll let you know how to spot monuments when out and about, what different monuments tell us about the people who once lived and worked here, and why these monuments are protected. This month it’s the Kirby Bank Trod, SM1405913. My computer has immediately told me I have made a spelling error, and if you’re not familiar with the local dialects or the Moors you might not have come across the word before either. 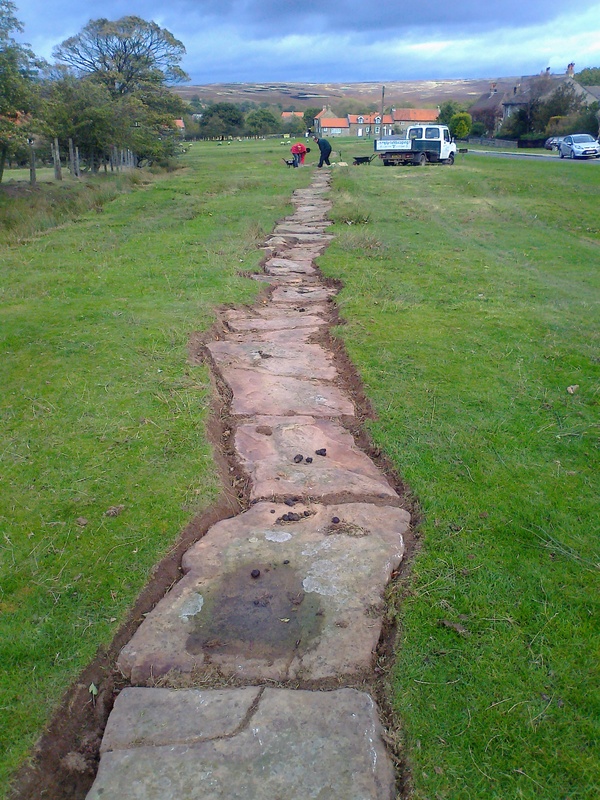 ‘Trod’ is a term for a trackway laid with flagstones, and there is a network of historic examples criss-crossing the North York Moors. There are other ancient flagged paths around the UK, but this National Park has the most known surviving trods in one place, and they are seen as characteristic of the area. Sometimes they follow the same routes as ‘Pannierways’, long routes traversed by trains of pack horses loaded with goods. A ‘Pannierman’ was a person who transported fish from ports to inland fishmongers, a primary use of some trods. A trod is a deceptively simple construction. Flagstones, sometimes carved, sometimes rough, are laid end to end in single file between two points. They are frequently made of stone from nearby quarries, and are usually no more than 0.5 metres (20 inches) wide. Surviving examples today often have a wide concave groove worn along the centre of the path, indicating how much traffic they have supported over the years. We think the earliest examples were probably built by the local monastic communities, who would likely be the only organisations with the resources to lay them in the medieval period. Trods would have been efficient ways of transporting goods (especially wool) between the many abbeys and priories and granges (outlying properties). 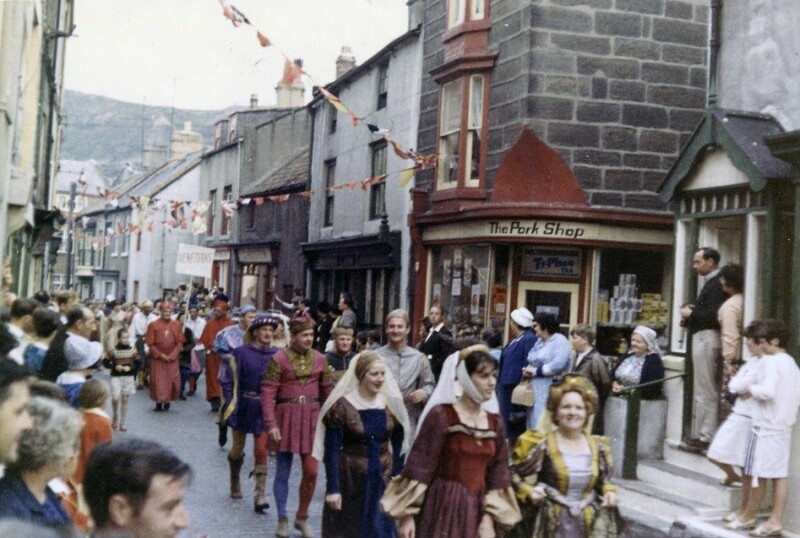 As their usefulness became apparent, more and more were laid, linking market towns, villages and farms across the moors. Further trods were built in the 18th century, and there may have been a bit of a renaissance due to smuggling enterprises on the coast. Although they slowly declined as better road surface technologies appeared which were then followed by railways, as late as 1890 pack horses could still be seen filing through Rosedale. We hold about 220 records for trods: many of these are fragments, just a few flags left in place, but others can still be seen stretching for miles across the landscape. 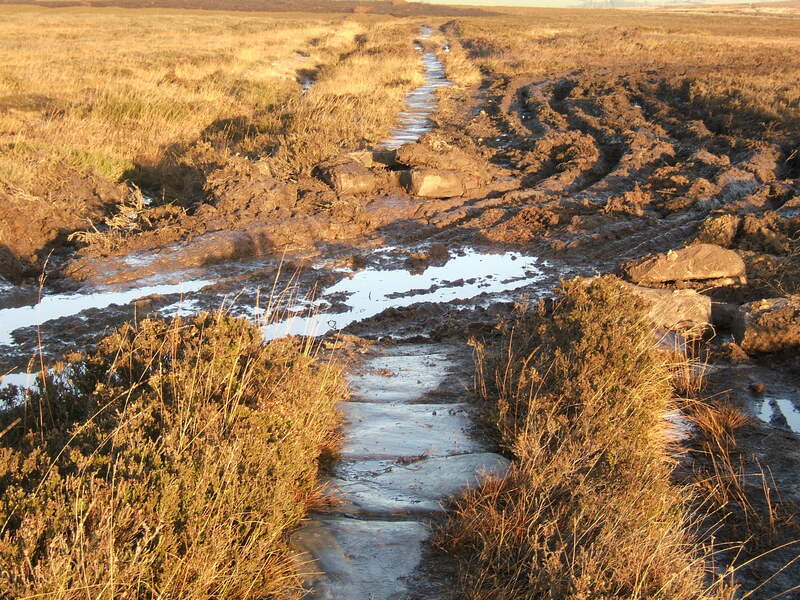 Paved causeways are a familiar feature on our Moors, yet surviving ones in good condition are becoming increasingly rare. It has been estimated that around 80% of our trods known in the 19th Century have now gone. With this in mind, ten years ago our local history group ‘adopted’ one – the Kirby Bank Trod. 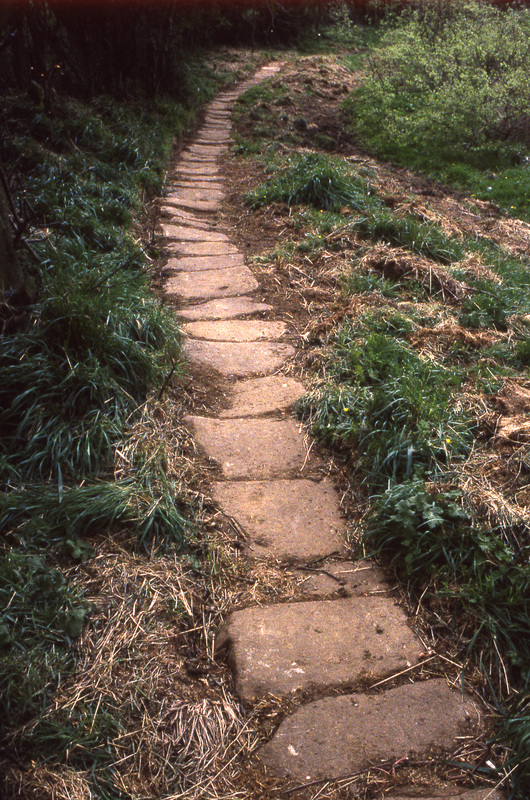 Trods are notoriously difficult to date, but we know this one was constructed on a man-made embankment in the late 12th or early 13th Century for the Cistercian monks at Rievaulx to link their monastery with their granges, their fisheries and their salt pans on the Tees. Centuries later it was used to transport building stone down from the quarries on the Bank: later still alum for the dyeing industry, jet for jewellery, and today by local and long-distance walkers. We’ve worked really hard to maintain a high profile for the Trod: holding a Festival of British Archaeology event, producing a Heritage Trail leaflet, publishing articles in the Dalesman, the Voice of the Moors and the local press. On the ground we’ve also germinated and planted replacement hawthorn ‘waymarkers’, arranged geophysical surveys and organised guided walks. We also carry our spades, edgers and brooms up the Bank twice a year to help keep the Trod from disappearing under grass and gorse! 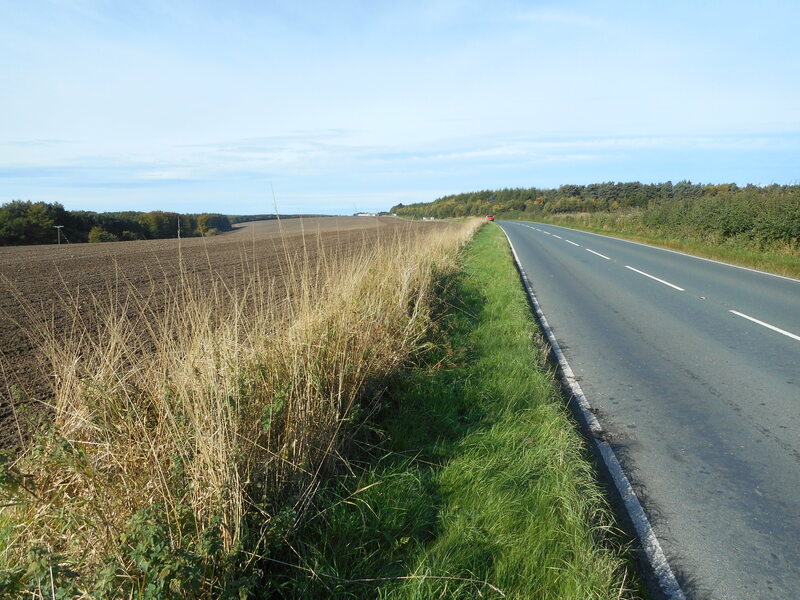 As a Green Road, Kirby Bank and its Trod suffered from frequent use by trail bikes and 4×4 leisure vehicles, causing serious damage to the stones and sandstone waymarkers and degrading the embankment the causeway rests on. We needed legal protection. 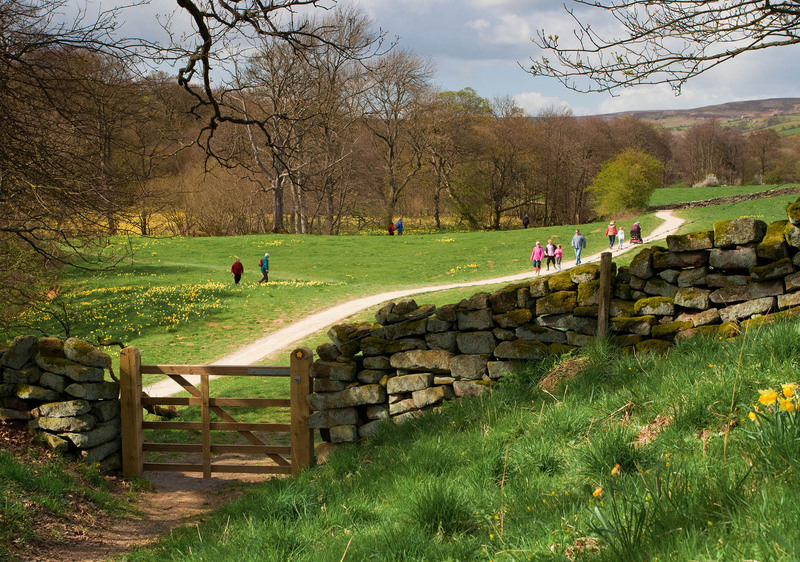 Luckily the Kirby Bank Trod is in good hands, allowing locals and visitors to continue engaging with the past by walking in the footsteps of Cistercian monks. But as the Group states, about 80% of known trods have already been lost. Given their location on obvious routes linking settlements, they can often come under threat from modern roadworks. 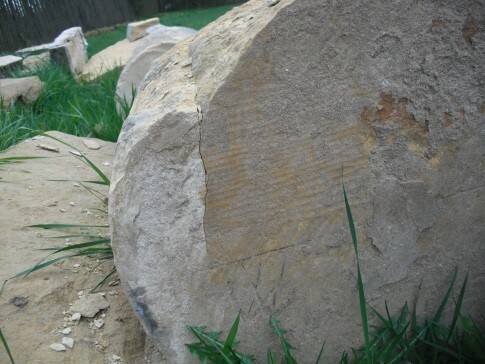 They also represented a very handy source of stone for builders over the past few centuries. The few remaining sections need to be taken care of to ensure our local cultural character and heritage is maintained. As ever, you can find out more about the fascinating archaeology of the North York Moors using our interactive Historic Environment Record map – you could look up your nearest trod and go and have a look. We’re always keen to hear what you find, so don’t hesitate to get in touch if you think a trod needs some attention. 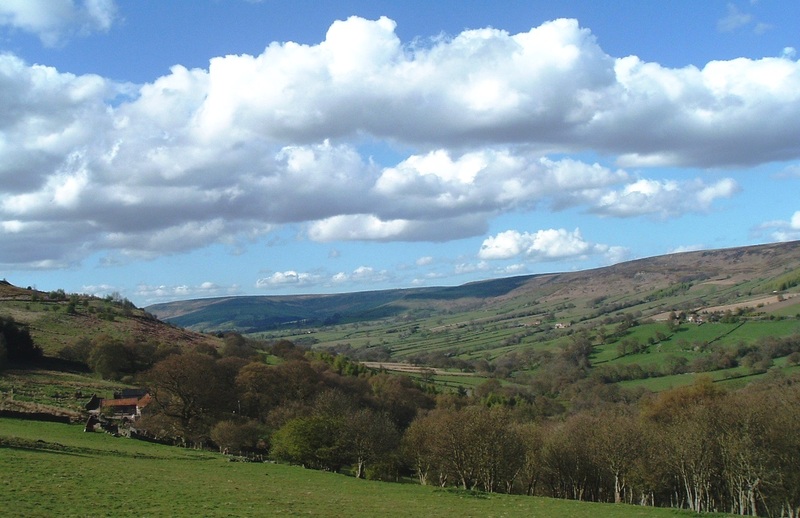 Our Senior Archaeologist is taking phased retirement, so before he goes he has been asked to reflect on his time with the North York Moors National Park. How do I sum up a career lasting over a quarter of a century in a few paragraphs? It is a strange feeling to have 26 years seemingly flash by so fast. 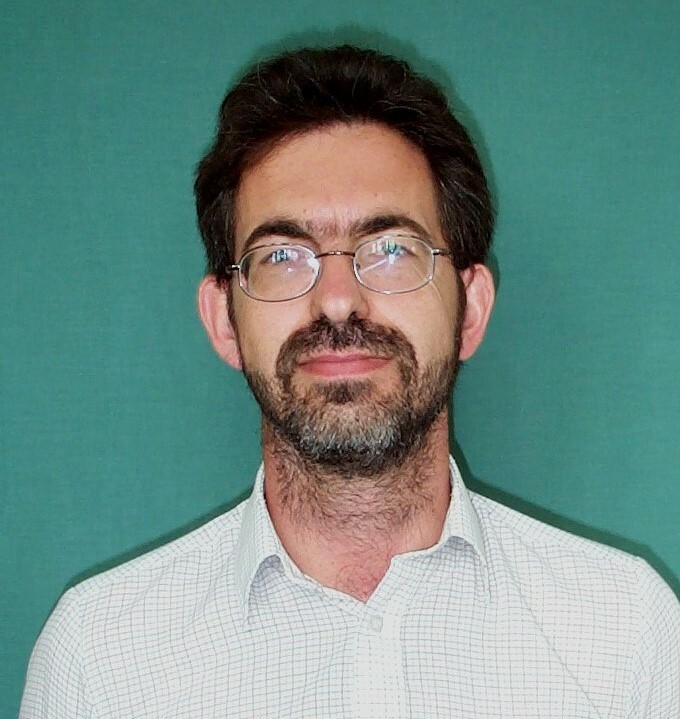 I started work for the North York Moors National Park in April 1990, having previously worked in the archaeology section of North Yorkshire County Council since the summer of 1983. I had decided many years before that I loved the north of England and had no desire to return to my southern ‘roots’. One of my first tasks with the National Park was the completion of a management survey of one of our large estates, encompassing moorland and large blocks of forestry. This quickly whetted my appetite for the excitement of making new archaeological discoveries – often very subtle earthworks, no more than a handful of centimetres in depth or relief – despite an exceptional tradition of previous high quality archaeological fieldwork in the region. Working solo in large blocks of conifers was a good test of dedication – crawling under the branches of dense stands of conifers searching for vague earthworks mapped in the 1890s – and the steadiness of nerve, when yet another wretched pheasant exploded out of the leafy vegetation where I was just about to step! In recent years the delights of discovery have been broadening thanks to new technology and techniques, especially LiDAR which provides an aerial view through tree and ground-cover vegetation of archaeological remains that were previously hidden or obscured. Human industry is also well represented – from the earliest iron industry through the search for alum into the full-blown “iron rush” of the mid 19th century, the exploitation of coal and jet, and the plentiful local rivers managed to provide motive power for a range of watermills. Research and conservation priorities relating to these local industries finally led to our new HLF Landscape Partnership Scheme, This Exploited Land of Iron. Some 15 or so years in gestation, it is very rewarding to see new generations captured by the excitement of the important remains of our 19th century ironstone industry and the associated development of early railways – although the original scheme for a canal link between Whitby and Pickering would have been a sight to behold and a major tourist attraction if it had ever been built. Into the 20th century, remains survive here from both world wars – in the form of coastal defences, army camps as well as troop training and target practice areas. 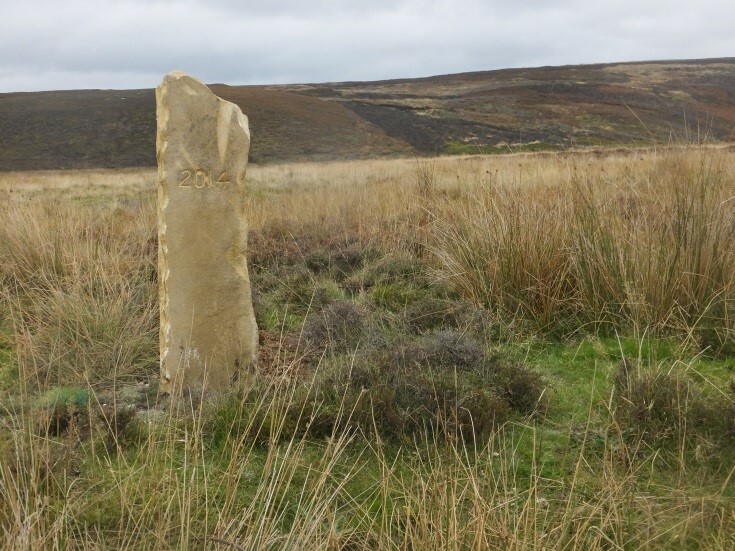 Finds are still occasionally made of 2nd World War unexploded ordnance in former training areas across the North York Moors, in particular after the wildfire on Fylingdales Moor in 2003 which affected two square kilometres of heather moorland. 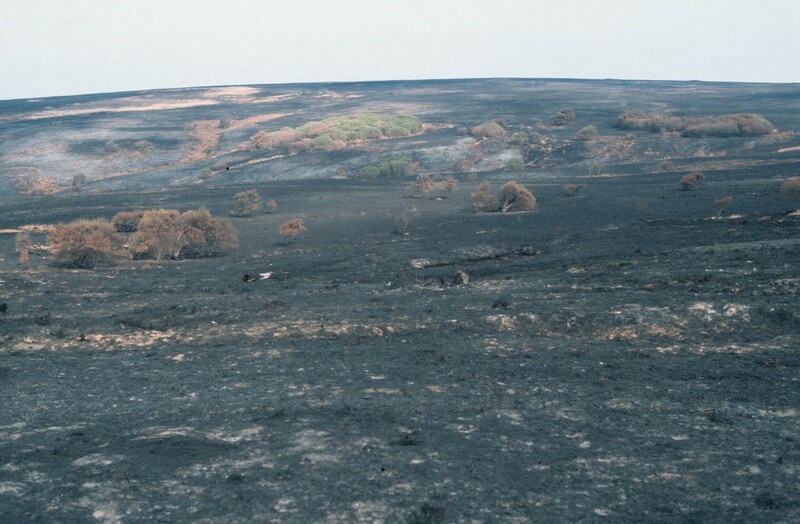 Although an environmental disaster – the severity of the fire in reducing the shallow peat cover to ash, this event was an archaeological revelation. Virtually everywhere you looked, subtle archaeological remains became visible, including the drip gulleys around former prehistoric round houses, low stony prehistoric boundaries and cairns, large numbers of previously unrecorded examples of Neolithic rock art and occasional shallow trenches which resembled grave cuts with a subsiding infill. 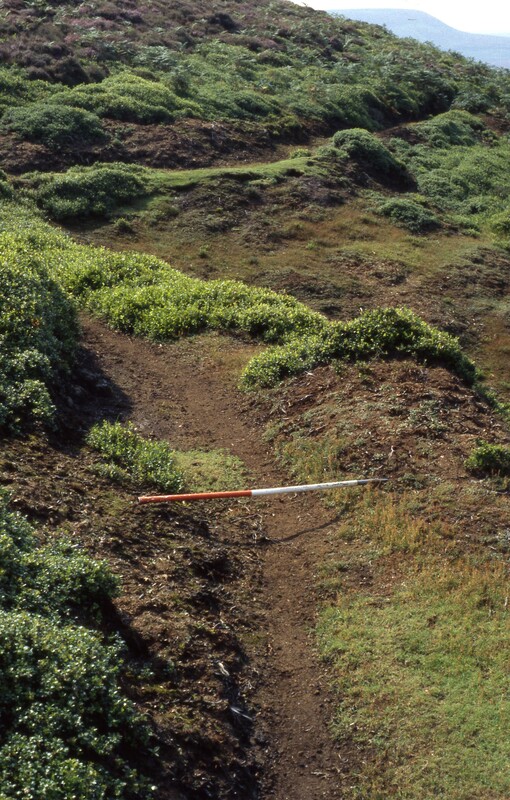 As numbers of the latter quickly increased their interpretation became clear – slit trenches from 2nd World War troop training. I remember my first visit to the site after the fire when the ground was reddened and blackened, covered in ash and still smouldering; few trees had survived and many had toppled after the peat holding their roots in place had been burnt away. Flashes of colour were very noticeable, such as an adder emerging from its underground refuge having survived the conflagration. A major project ensued, both to protect and restore the moorland habitat and to record and investigate the breath-taking remains of surviving archaeology. There have always been new specialisms to get to grips with. 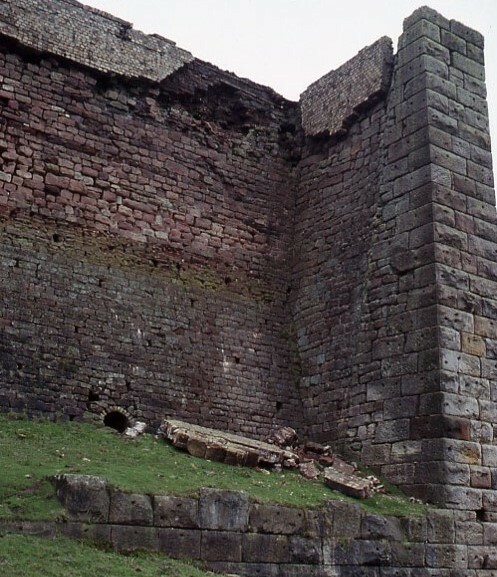 A visit to the Scheduled Rosedale iron calcining kilns with the Park’s Conservation Director at the time revealed that a portion of one of the kilns’ firebrick linings had collapsed the previous winter. This led to a major conservation project to stabilise these huge monuments which ran for three years in the mid 1990s, a forerunner of This Exploited Land which will continue the efforts to conserve these monumental sites 20 years on. It has been such a pleasure working with like-minded and dedicated professionals, both in my own National Park, but also with colleagues throughout the family of British National Parks, and Historic England and Natural England. We’ve shared experiences and ideas to the betterment of our discipline from research to management, and also shared the excitement of attempting to bring our subject, which we love, to life for anyone who cares to see and to get involved. 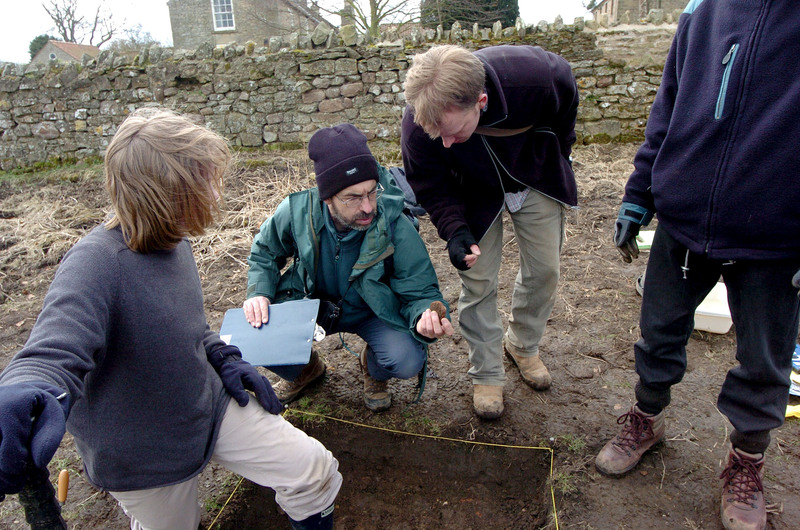 The National Park Authority is currently looking for a new Senior Archaeologist to lead on archaeology in the North York Moors. The closing date for applications is 26 January 2017. 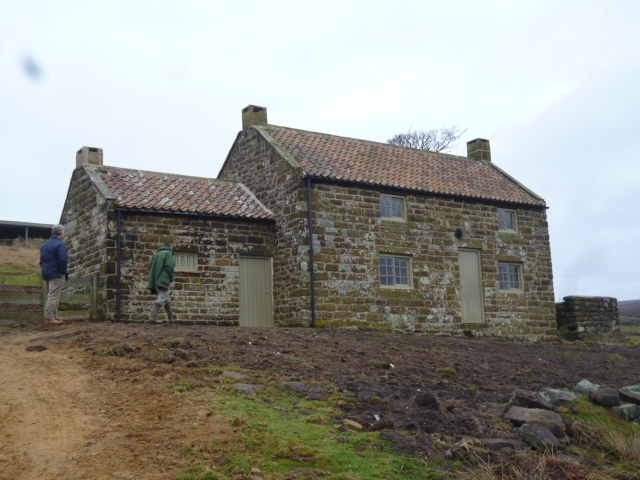 Over the years the National Park have had a number of grant initiatives allowing us to provide grant to support projects that help achieve National Park purposes and duties and to conserve the special qualities of the North York Moors. Some of our grant schemes tend to be targeted which means we usually approach the land manager and offer the grant (for instance, to enhance habitat connectivity), and others are open to application and awarded through a competitive process. So at the beginning of a new financial year with a new round of grants available, it’s these schemes, the ones generally open to application, which are described below. 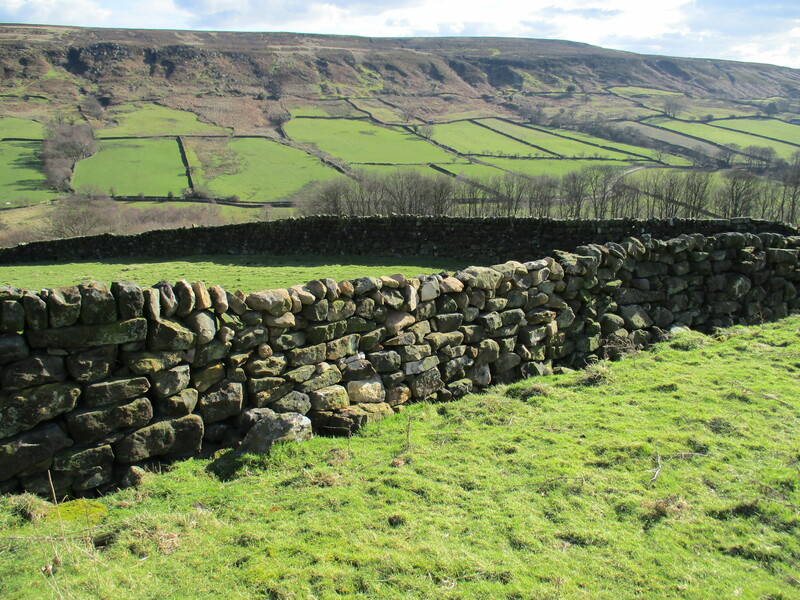 Our Traditional Boundary Scheme provides grant assistance (up to a maximum of £2,000 per holding per year) towards the cost of rebuilding drystone walls* and planting /restoring hedgerows. 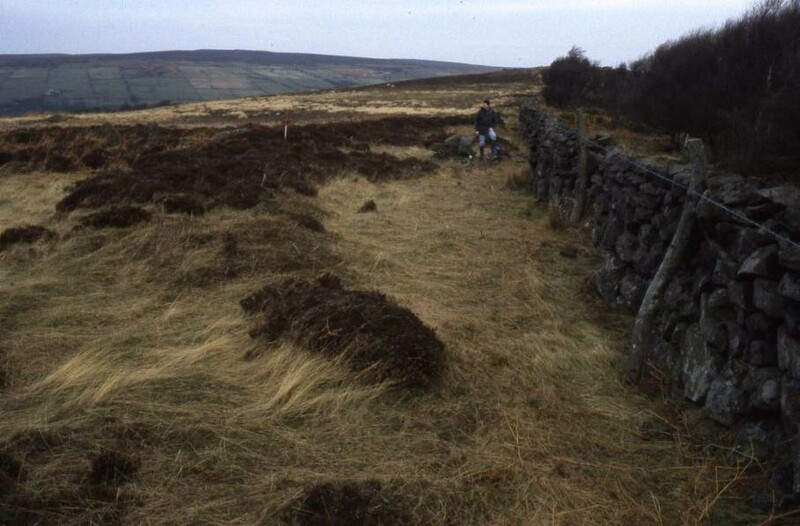 Traditional field boundaries are an important cultural element and landscape feature of the North York Moors. They also act as effective wildlife corridors. For more information – contact us. 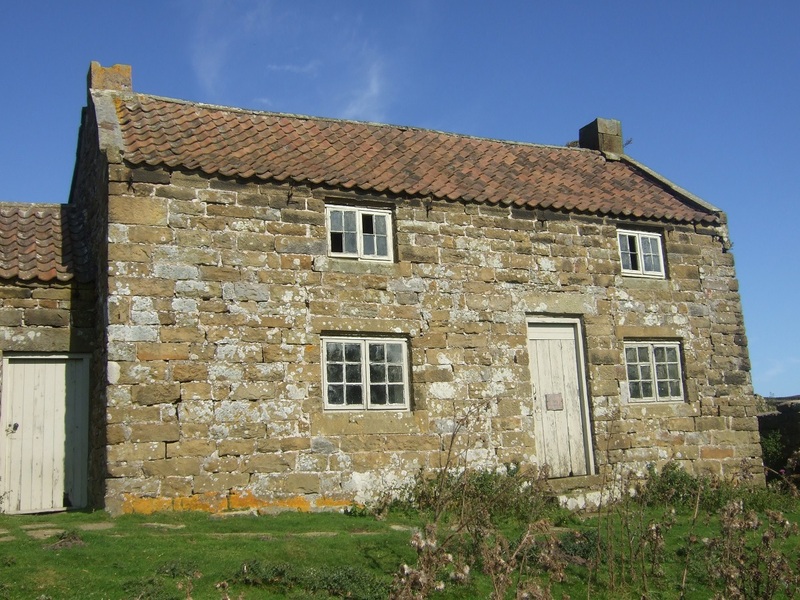 There are lots of historic buildings in the National Park which are of great value both in terms of the landscape and cultural heritage, so we want to help ensure that as many as possible are kept in good repair. Around 3,000 buildings are specifically listed for their special architectural or historic interest. 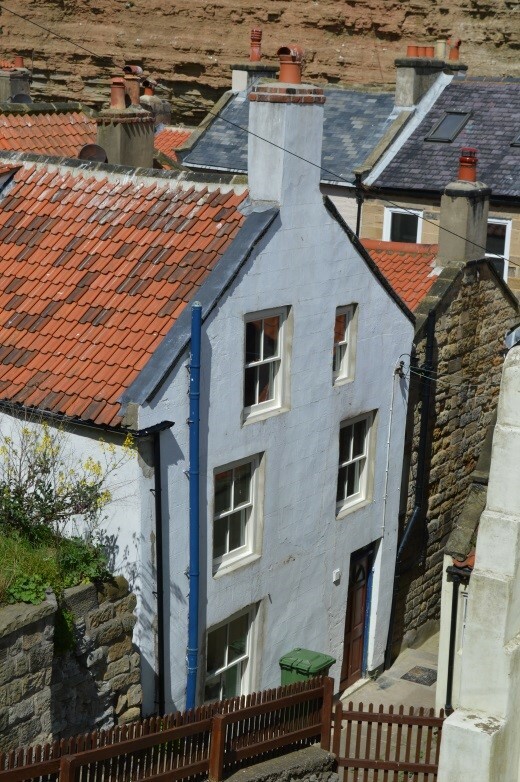 Historic Building Grants are available for repairs to Listed Buildings on the Authority’s “at risk” register. Grants are 50% of the cost of eligible works, up to a maximum of £7,500. There are also 42 Conservation Areas in the National Park. These are areas within villages which have been designated because they are of particular historic or architectural importance. 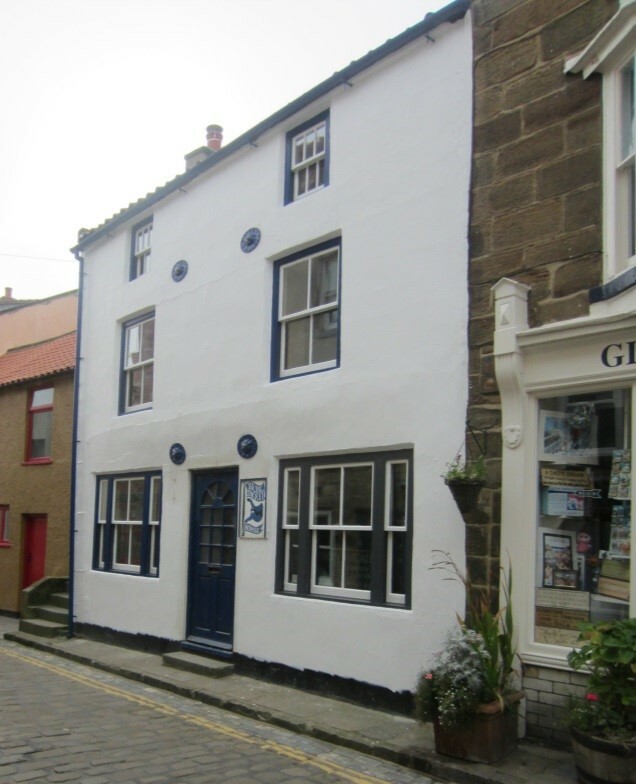 Conservation Area Enhancement Grants are available for re-instating lost architectural features such as windows and doors and using traditional roofing materials on historic buildings, within Conservation Areas. Grants will be 50% of the cost of eligible works, up to £1,500 per project. For more information on either of these two Building Conservation grants – see here. 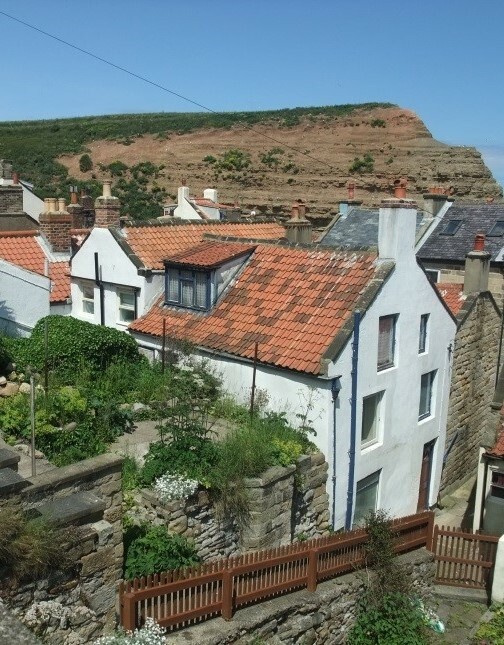 Our Local Distinctiveness & Tourism Fund aims to raise the profile of the North York Moors and promote its local distinctiveness. 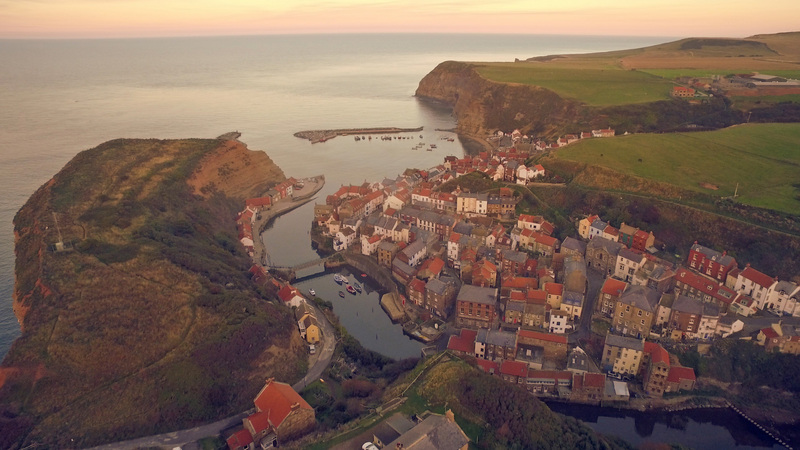 Grants are awarded to projects in the National Park area and surroundings which increase awareness of the North York Moors brand. Ideas need to utilise the area’s local distinctiveness and at the same time ensuring that any increase in visitors has no adverse impacts. For more information – see here. community facility improvements e.g. disabled access for a community building or improvements to a play area. Projects need to show clear community benefit and value for money. This particular grant has a short application window – for 2016/17 we need to receive applications by 30 June 2016. For more information – see here. The Community Grant is now into its fourth year. 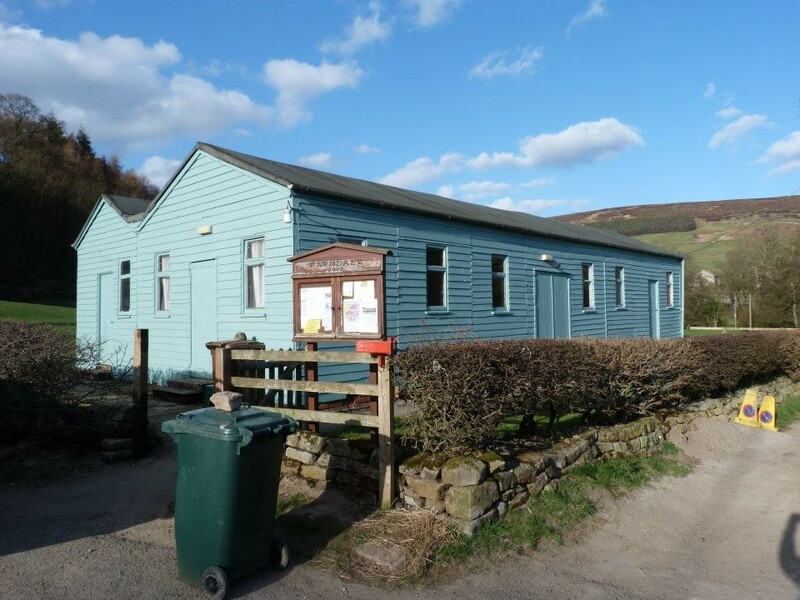 We’ve assisted a variety of functional projects over that time, one of which was the setting up of the Farndale Film Club by providing grant towards the purchase of equipment. We’re very grateful to the Club for the following report on its first year which shows just how beneficial local community projects can be with just a little grant assistance. 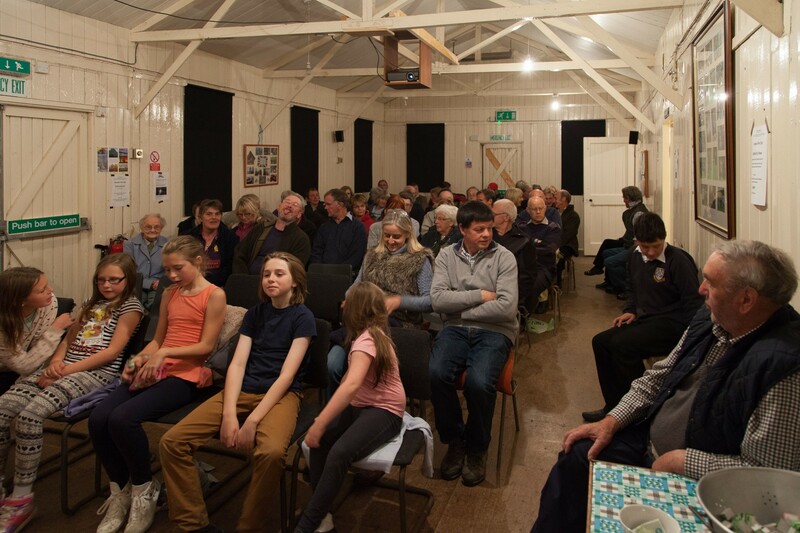 The Village Hall committee were very pleased to be awarded the grant to enable us to start our own community Film Club. The equipment and licences were bought in the early part of 2015, and installed by a community member with technical, IT and audio-visual expertise, and one of our trustees who is a qualified electrician and computer expert. Our first screening was on the 1st May 2015. The film was ‘What we did on our holidays’ – a British comedy, which was a real success. We had 24 people attending, and had organised refreshments, crisps and chocolate bars. Feedback from attendees was excellent. The blackout blinds worked really well in summer to keep the hall dark. The sound system was great, and the big screen made it feel as though you really were at the cinema! We decided to hold monthly screenings. Information about the screenings is given in our member’s community newsletter, on an email circular, and on posters inside the hall. Members are regularly asked what films they might want to see and all suggestions are welcome. We have had a wide range so far of films, including comedies, a western and recent films like Gravity and The Imitation Game. We have held eight general monthly film nights for members, which have had 142 individual attendances. 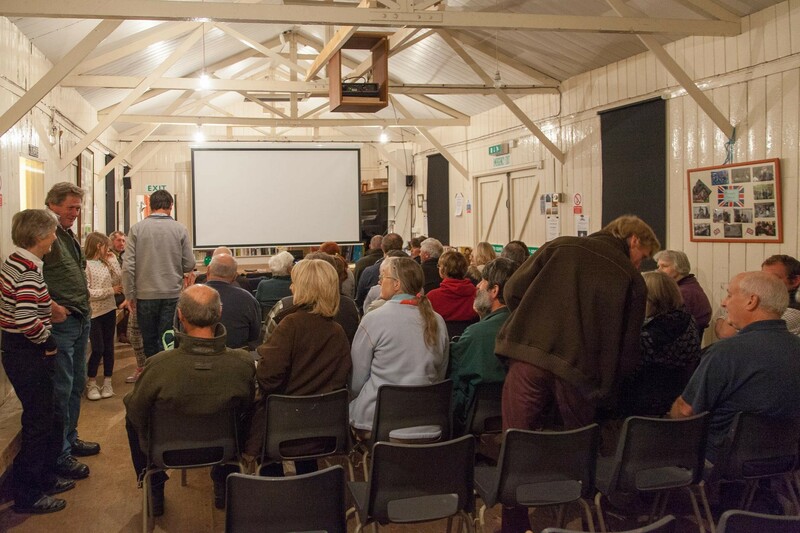 We also held a screening of a new independent film ‘Addicted to Sheep’ in October. This was a licensed film and we were able to publicise and promote the screening, and charge for attendance. We decided to charge £3.00, really just to cover the costs of the film (£150). We also sold ice creams, snacks and drinks. Overall at this film, we had 60 people attending, and contributed over £100 towards our 1st year costs. Everyone who came said they had had a really good evening. The Farndale Kids Club is also taking advantage of the equipment, and so far have shown three films – ‘Paddington’ in June; ‘Hotel Transylvania’ at a Halloween party in October, and ‘Elf’ in December. The children had a brilliant time. At these films we had overall attendance of 71. The children made themselves comfortable on rugs and cushions on the floor, and had ice creams and snacks. So overall, we have held three films for the Kids Club, eight films for the usual members club, and held an ‘open’ screening. Overall attendance of the 12 films has been 273. In the summer, we made another grant application to the Two Ridings Community Foundation – Grassroots Fund towards funding for some more comfortable seating, and were pleased to have the grant agreed in September. We have since purchased 30 new upholstered and padded chairs for use at the film club, and so far members have been very pleased with them. They are a big improvement on the old plastic chairs we had. Since we started, we have covered the overall equipment and first year’s costs of the Film Club – largely through your grant, also the income from our recycling Bags Collection, from members’ donations, and through snacks and soft drinks donations at the screenings. All the people who have so far come to the Farndale Film Club and Kids Film Club have been very positive about having a local venue where they can see films. Comments have been made about how good it is not to have to travel miles to see films, and also how nice it is to spend time with neighbours and friends in a different arena. For some of us, it is the only time we have been to a cinema in many years! Thank you again for your generous grant, it is much appreciated by all. A couple of posts ago we mentioned the restoration of the roof space at The Crown in Helmsley. Our Building Conservation Team have a helpful Advice Note for re-roofing a Listed Building, like The Crown, the crux of which is explained below. When re-roofing listed and historic buildings it’s important that the work preserves the character, history and appearance of the roof and therefore the building. The roof structure should generally be repaired rather than replaced, and historic roofing materials should be re-used wherever condition allows, or otherwise replaced on a genuinely “like for like” basis. 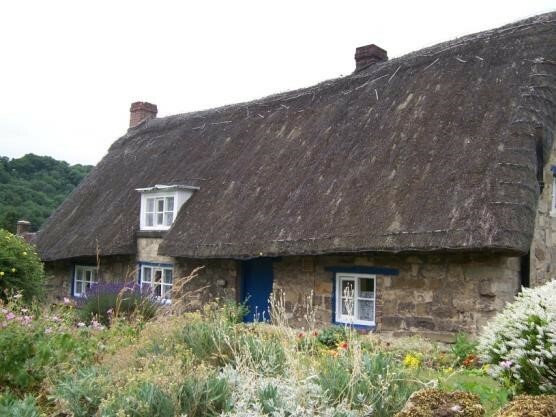 In the North York Moors, vernacular building roofs may be constructed from local timber of chestnut, elm or ash, unprocessed, round or waney-edged and sometimes even with the bark still on. On more grander buildings, timbers may be of sawn oak, whereas on “polite” buildings dating from the 18th and 19th centuries roof timbers may be of high quality, planed Baltic pine. 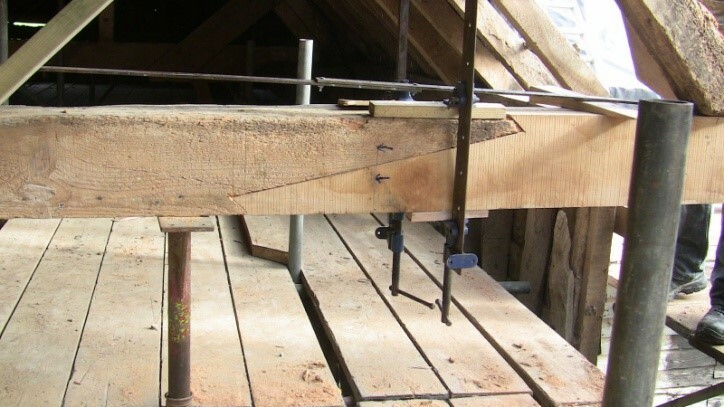 On buildings dating from the mid-19th century or later roof timbers are likely to be constructed from regular, machine sawn lengths. Roofs may incorporate timbers that were originally part of an earlier building, or which survive from an earlier period in the building’s history, such as upper crucks cut down from full (medieval) crucks when a cruck building was raised and reconfigured in the 18th century. Whatever the timber in a historic roof, it tells the story of the building, is characteristic of its age and type and it should be preserved during re-roofing works IF the building as a whole is to retain its character. Many old roof timbers will be curved and distorted; they may have been inserted as green timbers and distorted as they seasoned, or have bowed under the weight of the roof. However there is rarely a need to replace them for that reason. They may hold valuable evidence about the building such as peg holes, graffiti or jointing techniques, and they are irreplaceable because unsawn timbers are no longer readily available. Severely infested timbers which have lost their structural integrity may require replacement, but this is rare especially in oak or chestnut, and usually it is possible to strengthen the roof without the removal of historic timbers. Where roof timbers have been subject to insect attack they should be treated with a suitable insecticide, but most old timbers will show signs of woodworm holes which may not be active and are unlikely to have penetrated beyond the sapwood and so should not mean the timbers need to be replaced. An exception in regards to replacement are machine sawn square timbers in regular dimensions which can be replaced on a like for like basis because the style of roof can be replicated, with no intrinsic loss of character. 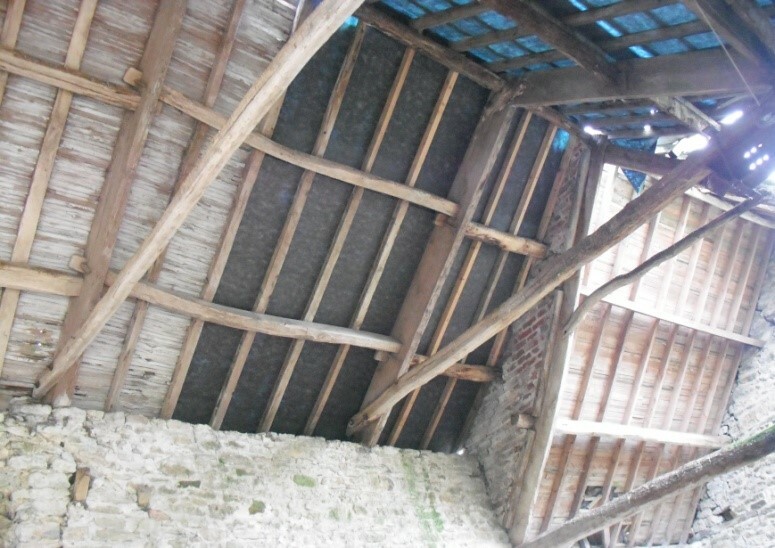 In order to repair and strengthen historic roof structures several methods may be used to avoid replacement. For instance, traditional timber repairs which involve splicing new timber into the old where it has decayed can be achieved by means of scarf joints, in which the decayed timber is cut away and formed into a lap joint to connect with a new section of timber. The two timber sections are then pegged or bolted through, thereby restoring the integrity of the timber. Supplementary timbers can be added side by side with the existing timbers where these are undersize or in a weakened condition. 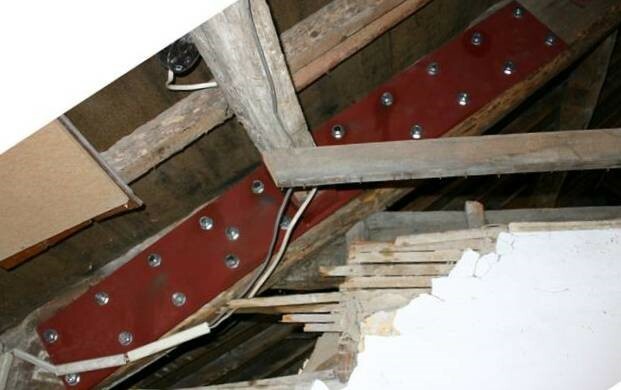 Purlins or rafters can be supplemented with new timbers, whilst leaving the original in situ. Metal plating can be used to reinforce joints that have become loose or have failed due to movement of the timber or decay over the years, or to bridge thin, weak, split or cracked lengths of timber. Such plates can be fabricated in mild steel (painted in a red oxide paint to inhibit rust) or stainless steel to suit the dimensions of the timber, and then fitted to the timber using nuts and bolts. Metal brackets can be fabricated to strengthen supporting features like purlins where tenons (joints) may have failed, and steel “shoes” may be used to extend the base of rafters onto the wall plate where rafter ends have rotted away, or steel angles used to strengthen and stiffen the connection between rafter and wall plate. Where they will be visible in the roof space, these steel features can be attractively designed and painted to ensure a restrained appearance. Most veteran roofs within the National Park are covered with pantiles or Welsh slates, although there are a small minority of buildings which retain stone slates, Westmorland slates or thatch. Whatever the historic material of the property, care should be taken to achieve a good match in sourcing replacement materials IF the original has perished. Imported slates can rarely match the purple and blue-black colours of Welsh slates, and also age differently and may have a shorter lifespan. 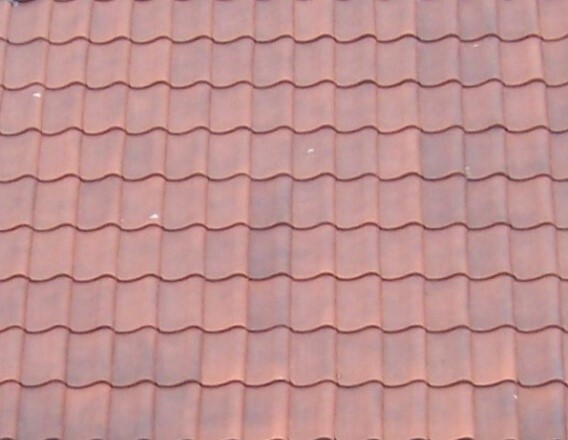 Handmade pantiles are significantly different from modern machine made tiles, particularly those varieties which are “interlocking” or given an artificial patination. By contrast, handmade pantiles have a rougher surface which will weather faster and will acquire the patina of the original tiles in time, as well as exhibiting variation in tone and slight inconsistencies in shape and finish which give them a handmade appearance. New handmade tiles are still produced, but reclaimed tiles and slates are also available as a like for like replacement. Any necessary modern ventilation requirements (Building Regulations) can be achieved discreetly, avoiding vents in the roof slope. It may be possible to used concealed ventilation on the eaves or ridge instead. 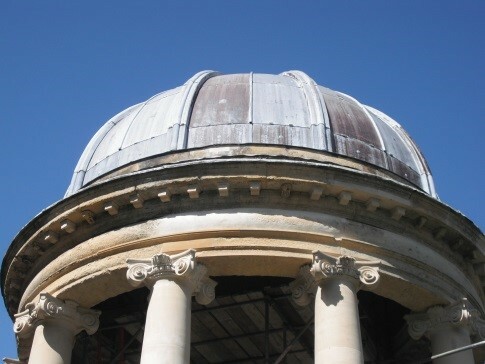 If you need further information, sources of materials or any clarification regarding the need for listed building consent or planning permission before re-roofing your listed building, get in touch with our Building Conservation Team. DON’T FORGET the bats. Bats are legally protected. Some bat species roost in roofs and so any building work which is likely to disturb bats needs to be planned carefully starting with a survey. The Bat Conservation Trust has useful advice available on their website. We talk on our Blog about the important species that make the North York Moors their home – wading birds, rare arable flowers, water voles etc. however Ami our Lead Senior Land Management Adviser would argue that the most important species whose home is the North York Moors, are the Farmers! The North York Moors may look wild and full of natural beauty but it is a largely managed landscape and it is the farmers that undertake the majority of that management which makes the area what it is. The National Park depends on its farmers. A few of their number have migrated here from other populations however the majority are born and brought up here and will spend all their working lives in the North York Moors. Their children often work on the farm but may also have to find work elsewhere to sustain the general population. This population is contracting with a decline in the number of farmed holdings in the National Park, from 1608 in 2007 to 978 in 2013 (Defra Farming Statistics). 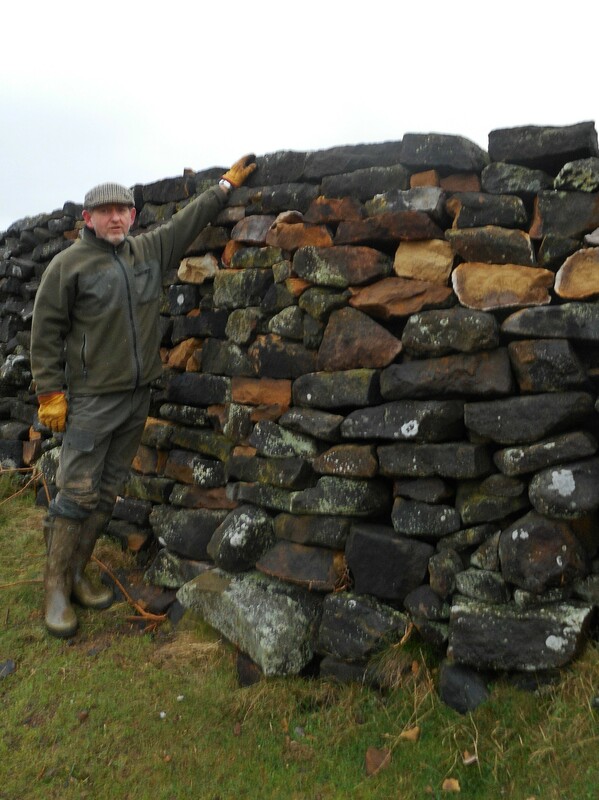 “No matter what their origins, all the farmers I meet have a great sense of pride in what they do and where they live – farming and the North York Moors is in their blood”. Farndale is probably the most famous dale in the North York Moors, mainly due to its population of wild daffodils which bring the visitors in spring to admire the golden views. 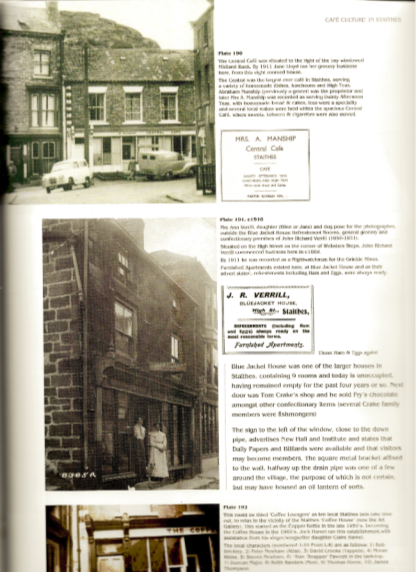 Here are five facts about Farndale. In 1955 (just three years after the North York Moors National Park was created) Farndale was designated a Local Nature Reserve to help protect the wild daffodils growing there. The designation meant specific local byelaws could be brought in urgently to prohibit the digging up and removing of bulbs which was considered a major threat at the time. Wild daffodils are also known as the Lent Lily, as they often bloom and die away between Ash Wednesday and Easter. But not always, and it’s worth keeping an eye on the National Park’s website to see when the flowers are blooming each year. In Wordsworth’s elegiac poem of 1798-99, ‘She dwelt among the untrodden ways’, the solitary and idealised Lucy lives and dies close to the ‘springs of Dove’. It has been suggested that this is a reference to the source of the River Dove which snakes its way down through Farndale and joins the River Rye. But there are also River Doves in Westmorland and Derbyshire, so a real river cannot be identified and the ‘Dove’ remains a poetical expression. It’s not yet been suggested, or maybe it has, that Wordsworth’s ‘host of golden daffodils’ in the poem ‘I wandered lonely as a cloud’ were the wild daffodils of Farndale. In the late 1960s Farndale was almost drowned through a plan to dam and flood the steep sided dale in order to create a source of drinking water for cities to the south such as Hull. The 1960s saw a rush of reservoir building aimed at securing water supplies. The proposed Farndale Reservoir would have covered 400 acres, submerged 20 farm-holdings and held 8 million gallons of water. But the plan was abandoned. 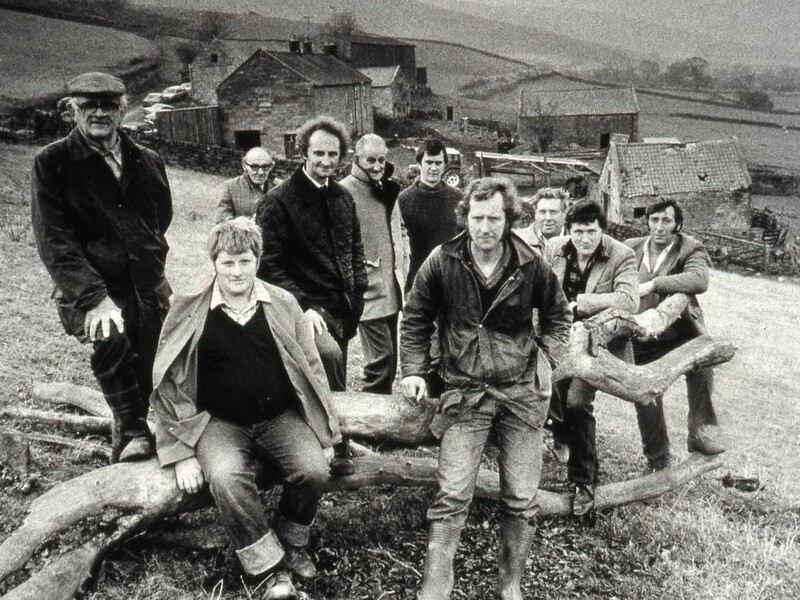 In 1990 (a year before the original national Countryside Stewardship Scheme was piloted) the National Park officially launched its own Farm Scheme (1990 – 2014), a local agri-environment scheme which provided grant aid for capital works and annual payments for environmental land management. The local scheme came about because unlike most of the other upland National Parks at the time, the North York Moors was never designated as an Environmentally Sensitive Area (ESA) for its landscape, wildlife and/or historical value, and therefore land managers here were missing out on ESA grants. 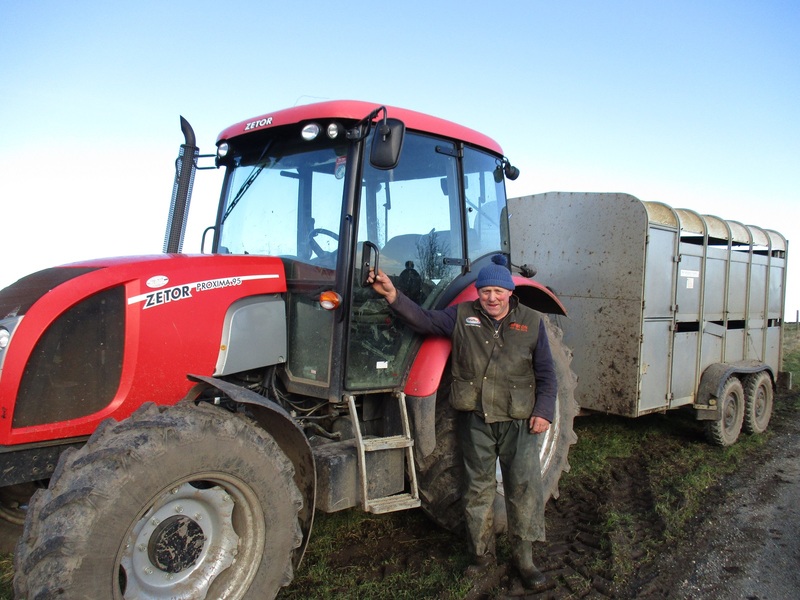 Nine farms in Upper Farndale were the first to join the North York Moors Farm Scheme, and all nine later secured national Higher Level Stewardship agreements because of their conservation value. 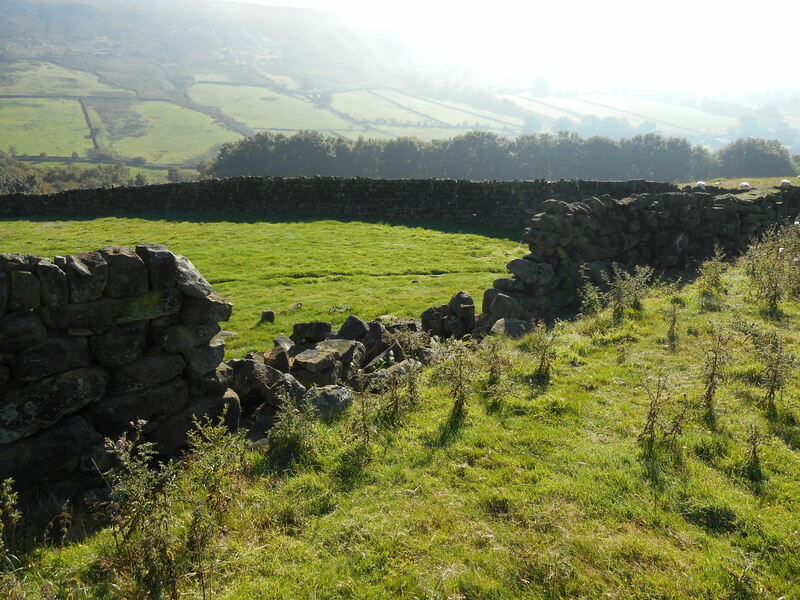 There are many examples of early field systems at the top end of Farndale. These most likely date from early medieval times (and some could potentially even be prehistoric), providing a visible example of how man has worked and managed the landscape for centuries. The field systems are still visible at the dale head because the conditions are difficult and so the farming remains extensive. The word Fenestration is an architectural term used to describe the arrangement of windows in a building and derives from the French word ‘fenestre’ meaning window. 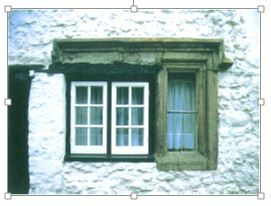 The vernacular fenestration in and around the North York Moors comes in many different forms from the more common styles of the Yorkshire sliding sash (below top) and vertical sliding sash (below middle) to the more unusual ‘Whitby composite’ (below bottom) which is a window style generally only found in the coastal area of the North York Moors. Windows are the ‘eyes’ of a building and their size, location and style play a key role in defining the character of a building. 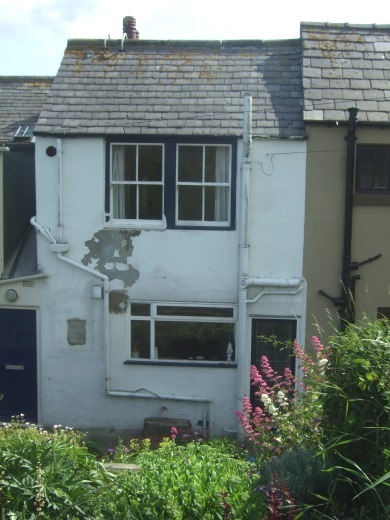 The choices made in relation to window replacements and their alteration may affect the character, appearance and ultimately the value of a property. 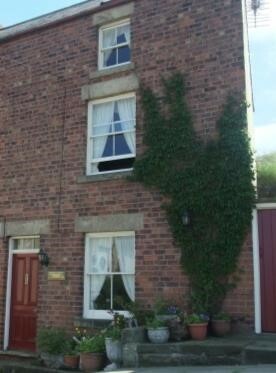 Traditional, vernacular cottages have small, simple and functional fenestration. This is generally concentrated on the principle elevation with fewer openings to the rear elevation which was a deliberate effort to minimise heat loss in cold winters. In contrast elegant and classical Georgian houses have symmetrically arranged, multi-pane windows without ‘horns’ – projecting pieces of timber at the base of the top sash – and are an intrinsic detail of this architectural period. Note how the windows become smaller towards the top of the house. This reflects the status and business of each floor and, in design terms, prevents the building looking ‘top heavy’. During the Victorian period glass making techniques developed and larger panes of glazing became more fashionable and affordable. ‘Horns’ were added to the top sash to add rigidity to windows which contained fewer glazing bars. Glazing is an important element in any window. Crown glass is one of the oldest forms of glass and is now very rare. Its main characteristic is its “wavy” or “rippled” appearance which really adds to the character of a property. It scintillates when you walk past and creates a beautiful quality of light internally. Crown glass was widely used until the mid-19th century but ceased being manufactured in the early 20th century. Therefore where old or historic glass remains it is very important it is not replaced. Float glass is the modern form of glazing invented in the late 1950s and involves flowing the molten material over a bath of molten tin. It is completely flat and therefore lacks much of the interest of earlier glass. Treatments added to float glass to increase its thermal performance can also make glass look like Perspex and so from a Building Conservation perspective this should be avoided if possible and alternative means of minimising heat loss should be considered. The timber lintel (i.e. 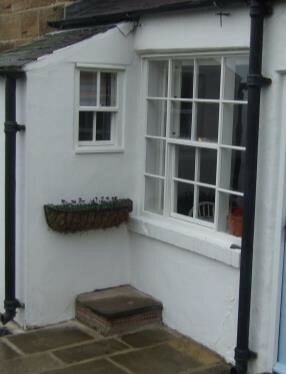 cheaper than stone) is a feature of vernacular buildings which is often seen on simple cottages and farm buildings due to their comparative lower status. They can also be found on the rear elevations of higher status properties i.e. out of sight, and are an important insight into the hierarchical status of different elevations and buildings. 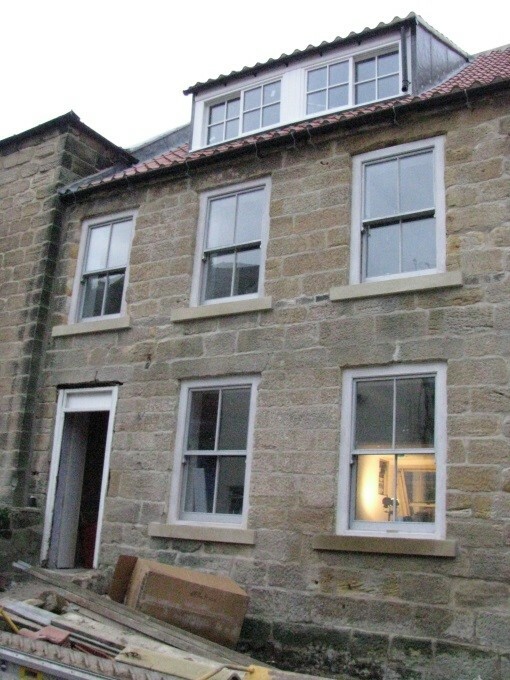 Often people rush to replace timber lintels with stone but by maintaining timber lintels in situ or installing them appropriately in new buildings people can help conserve this important feature variation. reinstatement of the original style of window. 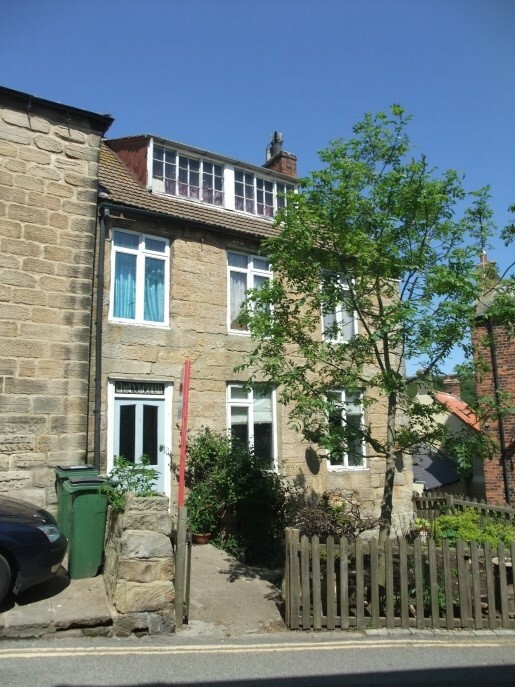 However it is common for a property to display several different historic styles as owners were influenced by different architectural periods over the long life time of the building. Where this happens, it’s always important to try to keep the clues that tell the story of the past. This stone-mullioned window (right) could easily be reconstructed, but the later nineteenth-century casement window is vital evidence of the building’s evolution over time. 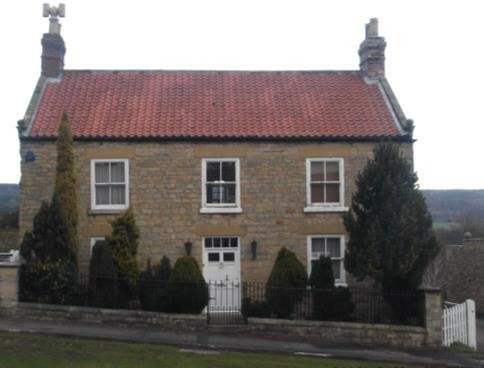 This cottage in Appleton le Moors (below) was formerly a farmhouse before becoming the village shop in the 20th century until it closed c.1980. Likely to have originally contained Yorkshire sliding sashes, this 19th century ‘Arts and Crafts’ revamp is a high quality addition that adds to the building’s architectural and historic character and contributes to the area’s local distinctiveness – its quirky and characterful. There are always windows which don’t seem to fit into any style and go against all the normal design principles. This house in Thornton le Dale (below) with four pane sashes at first floor provides a horizontal arrangement which goes against design principles, yet it is uniquely charming, adding character and interest to this Georgian property. 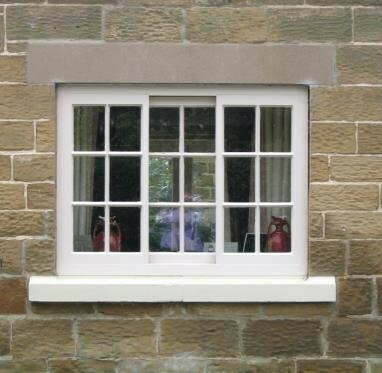 Historic England have useful guidance on the care, repair and upgrading of traditional windows. 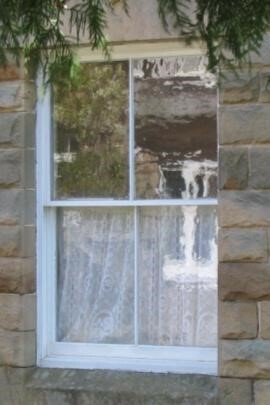 For the different stages of window repair see our previous blog post. During the 18th century, Joseph Foord, a self-taught engineer and surveyor, worked out that it was possible to bring the copious amounts of water available from the springs and becks of the high moors down to the drier limestone pastures of the Tabular Hills plateau in the south of the North York Moors, by means of gravity alone. The farms and settlements of the Tabular Hills were recorded as suffering summer droughts in the mid-18th century, which caused high stock losses and considerable distress to the local populations. By bringing a dependable water supply to these areas, agricultural productivity could be increased and the conditions for the villagers improved, and therefore once their worth was clear the local landowners were prepared to commission Foord’s practical solution. Foord (1714-1788) was a yeoman farmer with an interest in a colliery near his home in Fadmoor, and who also specialised in water mills. Familiar with water leats and their management, the first commissions ran across Duncombe Park Estate land where Foord and his father before him worked as land agents. His water races (or channels) were a work of remarkable surveying skill and hydrological engineering which enabled the transfer of water using only gravity and created at a time when detailed maps and contours were unknown, Foord stands out as a true visionary and a man of exceptional capabilities. Over 75 miles of created water races are known in total and these can still be traced across the landscape over large distances. They survive largely as shallow ditches with low embankments, particularly on the downhill side, which closely follow the contours, and in many places they have structures associated with them, such as stone culverts known as ‘smoots’ where they pass beneath field walls, and ‘brigsons’ where stone slabs are laid across the channels to carry paths and tracks. Some also have small scale aqueducts and tunnels. The longest race – Rievaulx – is 12.7 miles and illustrates Foord’s considerable skills, working with gradients as fine as 1 in 430. The water races are an important historical and cultural feature of the North York Moors. At present the water races have no statutory designation, but as a group they have been assessed by Historic England as being of exceptional national importance. 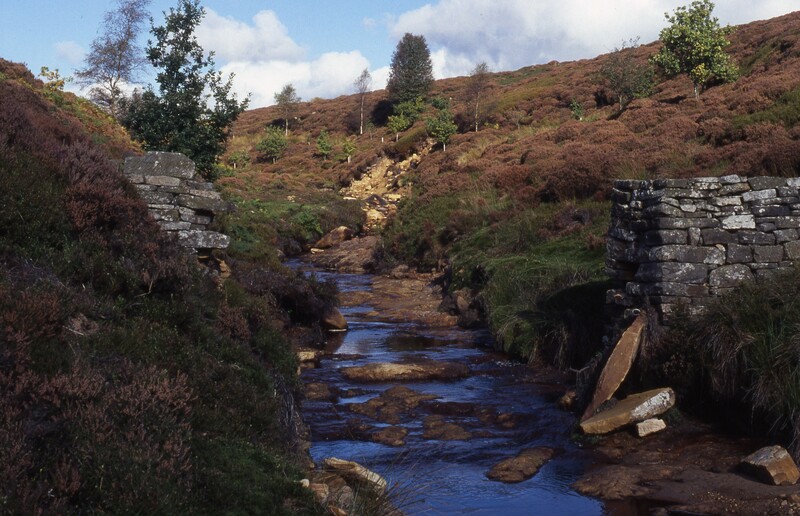 Research into the network of Foord water races was undertaken by Dr Isabel McLean and published by the North York Moors National Park Authority in 2005 as Water from the Moors. The Life and Works of Joseph Foord. Since then, the Helmsley Archaeological and Historical Society, with the assistance of the National Park, have been surveying the Foord water races with the aims of locating the individual features identified in Water from the Moors, recording the condition of all known sections of water race and highlighting areas where there may be opportunities for improved management or restoration. 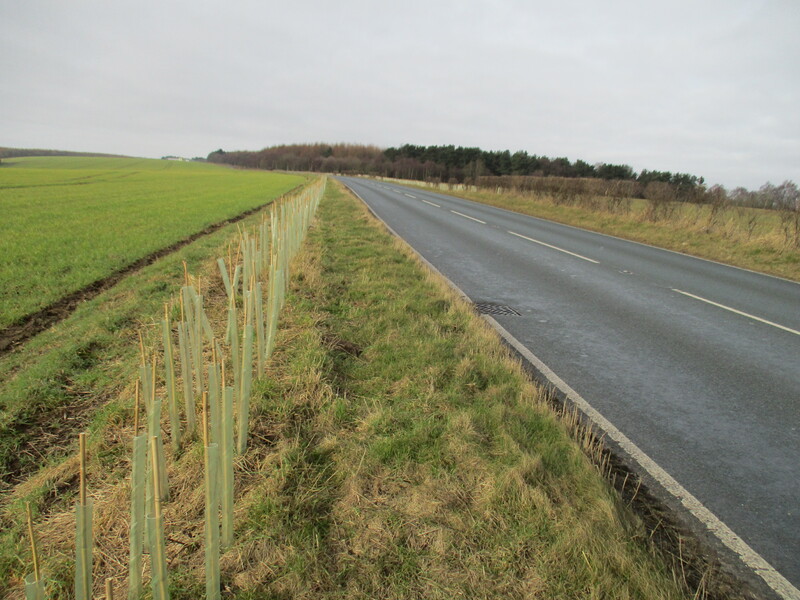 This work has been continued in recent years by Ed Dennison Archaeological Services Ltd.
Upland mixed ashwoods (a national Priority Habitat) are an important habitat and landscape element of the North York Moors. Ash is usually the major component of this woodland type, but oak, birch, elm and small-leaved lime may also be present. Typically ash and downy birch are the dominant canopy trees with hazel dominating the understorey. Mixed ashwoods are amongst the richest habitats for wildlife in the uplands. They support a rich ground flora often dominated by dog’s mercury, with common dog violet, early purple orchid, and primrose. Ashwoods can be but may not necessarily be ancient, as ash is able to colonise open ground relatively easily. These mixed ashwoods are usually found on free-draining, base-rich limestone soil, but in the North York Moors ashwoods are also found on slightly acid soils where there is a flushing of nutrients along riverside strips or on flushes and outcrops. Ash trees are often found in fields and hedgerows too; they are a common farmland tree. Chalara fraxinea is a tree disease – also known as Ash Dieback – caused by a fungus (Hymenoscyphus fraxineus), which has been recorded in the UK since 2012. 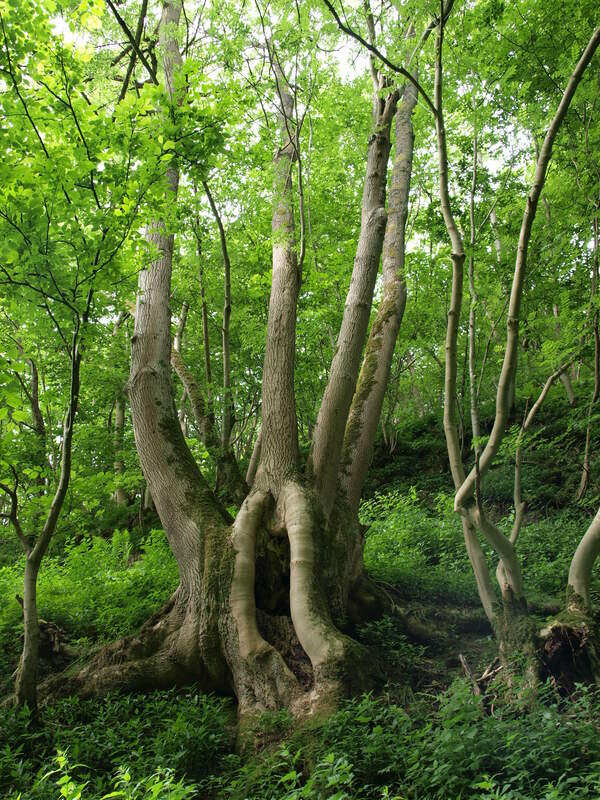 The disease particularly effects Common Ash and usually kills the tree either directly or indirectly (the tree is fatally weakened) – young trees die more quickly than older trees so older woodlands tend to deteriorate slowly over time. The fungus can be spread by the wind, so unsurprisingly and probably inevitably it’s reached the North York Moors. Not removing ash trees and woodland arbitrarily is important to potentially help identify tolerance. The best hope of a long-term future for ash trees and woods is by identifying the genetics that mean some ash trees tolerate the infection, and then breeding new generations of tolerant ash trees for the future. There has recently been encouraging progress made by the University of York/John Innes Centre. It’s definitely not hopeless – and maybe if you’re reading this Blog in 20 years’ time Chalara will have been made ineffectual. For now it’s important to report sightings of Chalara because it’s a notifiable disease – Tree Alert. 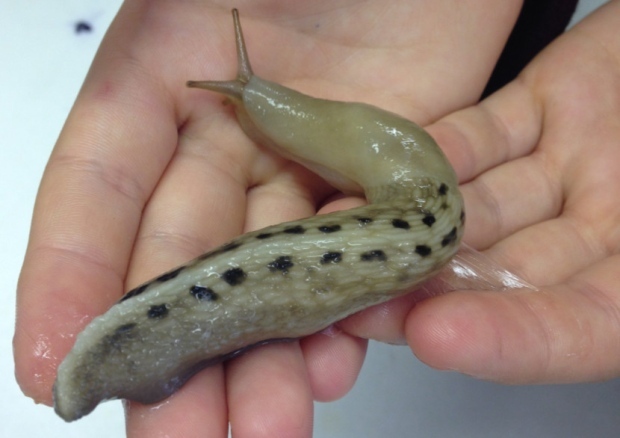 The only known UK location for this beautiful rather large slug is in the grounds of Fyling Hall School in Fylingthorpe. Its closest relative is from the Appennine Mountains in Tuscany. 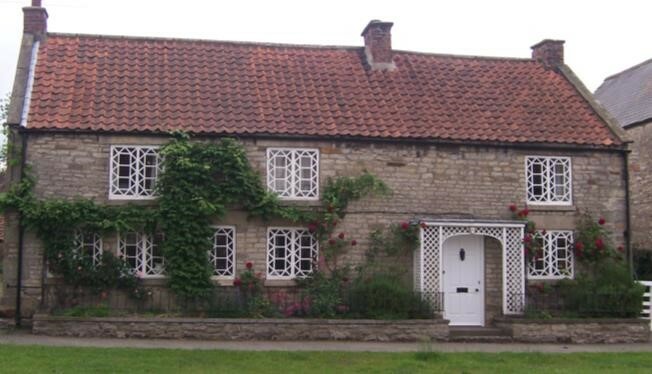 As to how the species got to Fylingthorpe on the rugged North Yorkshire coast – it is suggested that eggs could have arrived with an Italian marble fireplace imported for Fyling Hall (now the School) back in the 19th century. This Fylingthorpe subspecies has not yet been given a scientific name. We like Top 10 lists on this Blog – here’s a Top 5 instead. Our Building Conservation team pick their Top 5 projects from the last financial year. These Top 5 building conservation projects are some of our favourites and have been selected to give a snap-shot of some the work the National Park Authority has been involved in. Not all these projects involved direct grant funding but they all included our input in one way or another. The projects aren’t in any particular order and are featured for a variety of reasons such as size and scale, uniqueness, quirkiness, or because the works have been a labour of love carried out by the owner! 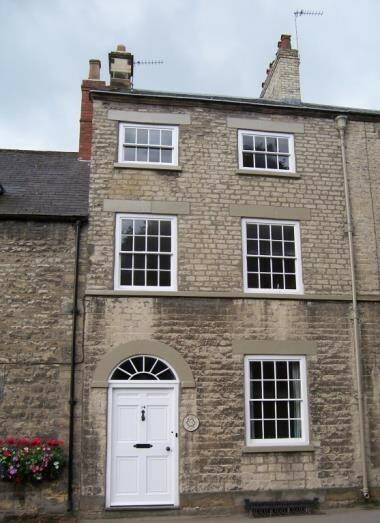 The replacement of modern unsympathetic windows and reinstatement of old style vastly improves the appearance of a property. This can be a simple task to undertake when there are old photographs for reference, or the size and shape of the opening clearly indicates its former style. However in this case, it is obvious that the existing downstairs window was a relatively modern intervention and therefore in order to find a suitable style and arrangement to compliment rather than detract from the host property lots of sketches were drawn up to compare and consider. This resulting unequal sash adds to the diversity of the area’s architectural features. 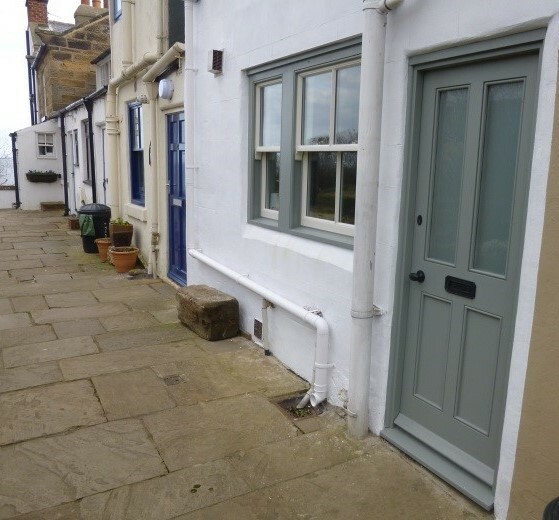 Last year there were several projects in Staithes which saw the reinstatement of more traditional style windows to properties located in the heart of this important Conservation Area. 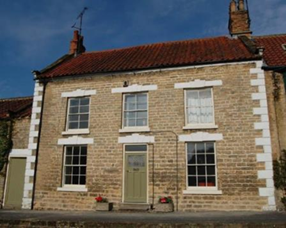 This is Chapel Cottage – where modern windows were replaced with traditional vertical sliding sash windows and Yorkshire sliding sashes to the dormer. Here, old photographs were used to evidence an older style of window. 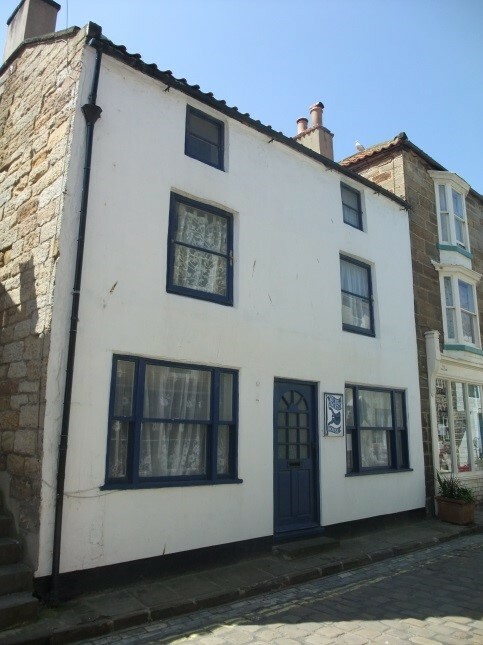 Consideration was given to the possibility of removing the render to the front, however the old photos shows that this was a former shop and therefore the stonework underneath was unlikely to be of good enough quality to expose. 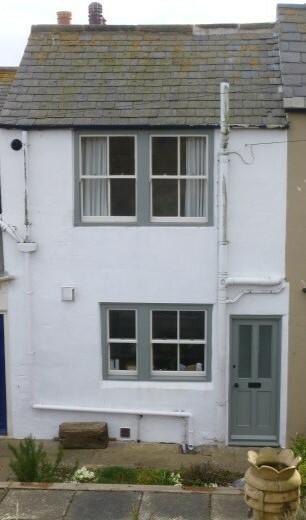 The two tone paint colour, (a typical feature of coastal villages) enhances the local distinctiveness. Waymarker stones may seem relatively insignificant as listed structures compared with castles and cathedrals, but they were culturally important. Historically they were guide features for people traversing the moorland, defining the route to follow in a landscape which has very few points of reference. For this reason, waymarkers are still found across the moors. However where modern roads follow the same historic routes often waymarkers have been lost through damage or theft, which was the case along the Pickering to Goathland road. Of the seven recorded listed waymarkers, only one was still in place. In order to maintain the evidence of this historic route, we worked with the Estate to reinstate six of the lost waymarkers. A local farmer was particularly keen to see them reinstated as in winter when the snow covers the moors they still define the line of the road which is as useful now as it was in the past. 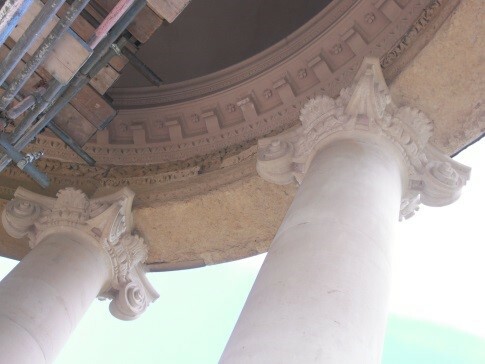 In contrast to waymarkers and windows, due to the sheer scale of the work involved the Ionic Temple project was a milestone for the National Park Authority. The Temple had been on English Heritage’s ‘At Risk’ register since its inception in 1985. 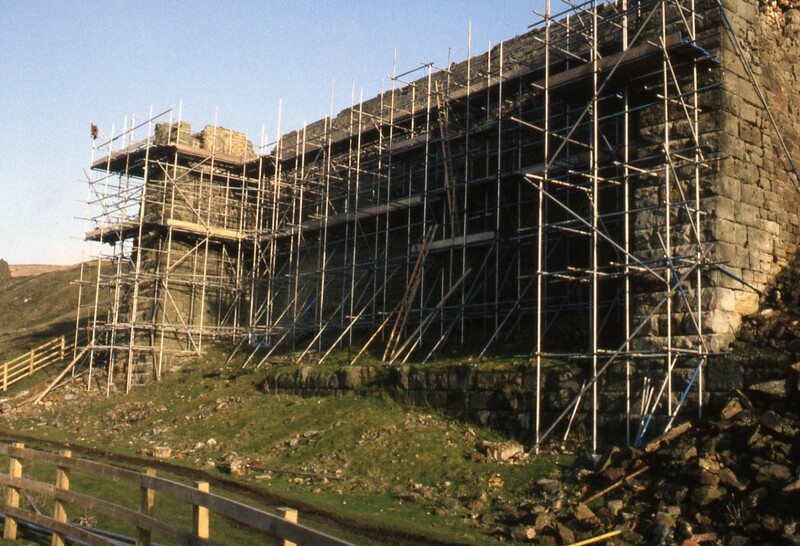 The repair of the Temple was a big project to be involved in, alongside many other funding bodies. See our previous blog post for more details. The companion Tuscan Temple, at the other end of the Rievaulx Terrace, is due to be repaired through Natural England’s Higher Level Stewardship Scheme.